I'm still totally having withdrawal symptoms from Florida! I just can't get over how much fun I had and how much better life seems when your days are full of family, fun and sunshine. Anyway, amongst my other shopping I purchased a lovely make-up bag from Victoria's Secret, which may I add is such a beautiful shop. I'm always changing up "What's In My Makeup Bag" but I decided that it was a good time to do a new post, especially with my pretty new makeup bag. I haven't added or taken away any products, so these are exactly the products I'm using right now. I hope you enjoy this post beauties, and as always if you need any help and advice then make sure you leave your comments in the section below. This has to be my most raved about foundation of all time and unless something dramatically changes, then I can see this being in my collection forever :) - It really does create a flawless finish without being heavy in the slightest. This concealer is absolutely amazing at covering dark circles, as well as keeping the eye area hydrated. It also doesn't crease, which makes it look super natural all day long. I always like to keep this handy, as it is an instant pick me up and helps to soothe tired eyes. It also doesn't affect your concealer, which makes it even better to have in your make-up bag. This is such an amazing mascara and gives your lashes an instant boost, which is great for awakening they eye area. I'm loving using it at the moment, and as it doesn't clump at all its a great option to keep in your make-up bag. This lipstick is a total show stopper and it is a beautiful Bright Pink, which can be dressed down to be a pretty pop of day time colour, or dressed up to create a statement look. It's also really comfortable on the lips, as well as lasting well before having to be re applied. The quickest solution to perfection :D It highlights and banishes dark circles within seconds, and it looks super gorgeous as well. This was totally my best friend in Florida, as it has two gorgeous blush shades, a highlighter and a bronzer! - It's also fab to travel with in general, and its great to have everything under one roof! Having structured eyebrows totally transforms my face, so this is a must have for me :D - It's also super easy to use and comes with mini tweezers to solve any brow dilemma's quickly! So I don't have any of these items! Whyyyyy! I need them all! Gah, you have such great items. Love it. The only one I have is Benefit They're Real but it's amazing! 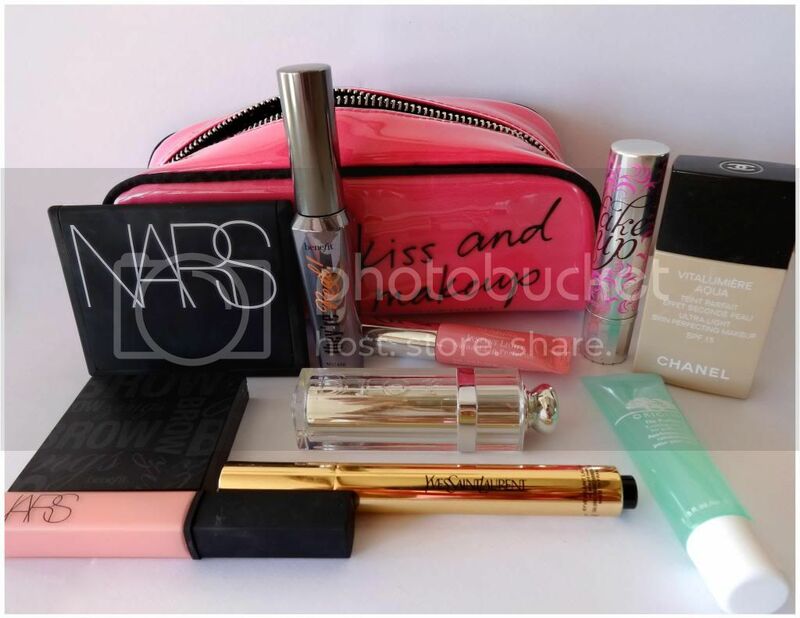 Lovely items, the Dior Lipstick looks gorgeous! Love your make up bag. firstly so jealous of you going to florida! hehe! secondly great products girl! Ooo a fabulous selection of cosmetics lovely, I'm super eager to try Chanel foundation! 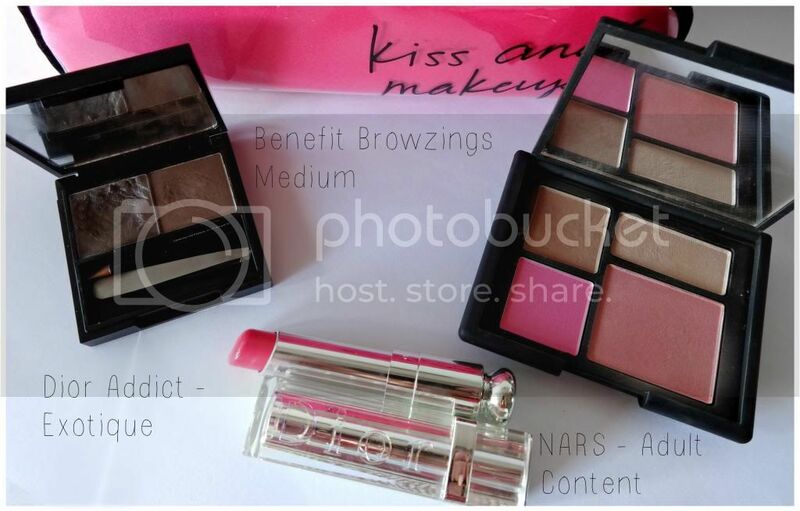 I lovee Benefit They're Real and Browzings, two of my all time faves! I reeeally want to try the Chanel Vitalumiere Foundation- it sounds amazing!